Boston artist Charles Coe’s photography and stories display highlights Mission Hill residents and workers in “What You Don’t Know about Me,” which begins today and runs through September 30, 2018 in Gallery J on the first floor of the Johnson building at the Central Library in Copley Square. 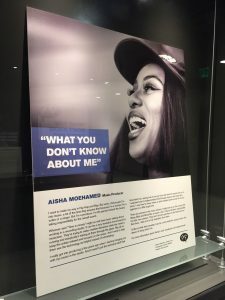 This show is the first to occupy Gallery J, which was primarily created to feature the collections of the BPL and related programming in conjunction with the Central Library Renovation, completed in 2016. 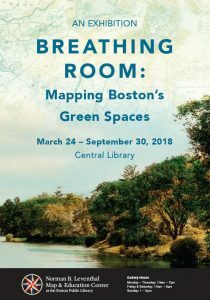 “Boston Public Library welcomes visitors to meet the friendly faces and voices of one of Boston’s storied neighborhoods in the library’s newest gallery space, in what we hope will be the first of many displays sharing experiences and artifacts that embody our collective cultural heritage,” said Meghan Weeks, Boston Public Library’s Curator of Interpretation. “What You Don’t Know about Me” is the second phase of a project created by Charles Coe as a 2017 City of Boston Artist-In-Residence. Coe was chosen, along with nine other artists who work in a variety of media, to establish community-based, collaborative art projects in cooperation with Boston Centers for Children & Families (BCYF). Based at the Tobin Community Center, Coe traversed the Mission Hill neighborhood collecting bits of personal history from people who live or work in the neighborhood and matched each anecdote with a photograph of the teller. The stories offer combinations of image and story that create moments of surprise and encourage us all, in an increasingly divided society, to move beyond stereotypes and preconceptions and engage our neighbors with open minds. This exhibition compares the landscape of today’s “new” Boston with that of over 100 years ago. 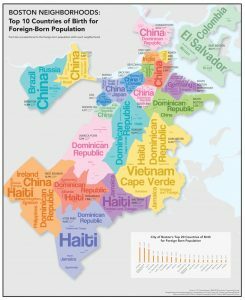 The maps and graphics on display here show where Boston’s foreign-born residents originate from, and where newer immigrant groups have settled, while celebrating who we are, and the vibrant diversity that is Boston. View the online exhibition. The mapping of broad climate zones, wind direction, ocean currents, and related weather events has a long and storied history. In this exhibition, you will discover how “Venti” were wind personas who directed ancient ships and “Horae” were goddesses of the seasons who dictated natural order during the 15th-17th centuries, how Enlightenment scientists started to collect and map weather data, and how 19th century geographers reflecting the golden age of thematic cartography created innovative techniques to represent vast amounts of statistical data and developed complex maps furthering our understanding of climatic regions. 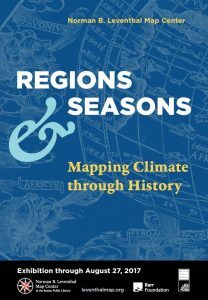 As you explore five centuries of regions and seasons, you can compare this gradual sophistication of mapping climatic data with the modern use of computers and models that analyze the impact of changing climatic conditions on future generations. View the online exhibition. William Shakespeare: poet, actor, playwright, icon. More than four hundred years after his death, he remains a central figure in English literature and a cultural phenomenon on a global scale. Yet the inner workings of his life and the details of his creative process remain largely unknown. In many cases, there is still fierce debate over what Shakespeare actually wrote. 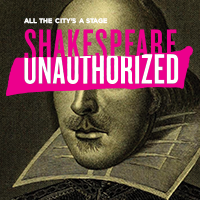 Shakespeare Unauthorized pulled back the curtain on four hundred years of collaboration, confusion, and even literary deception that surround the plays, poems, and life of William Shakespeare. Through an unprecedented exhibition of the Boston Public Library’s world-class collections—including one of the largest and most comprehensive collections of Shakespeare in a public institution— visitors could view some of the rarest, most extraordinary books in the world and learn about the countless men and women who have made and remade the works of a literary icon. William Shakespeare’s plays are set in Europe, Asia, and Africa, from classical times to the Renaissance. How did he and other authors, mapmakers, and readers of his day imagine foreign and often-exotic settings, the “other” as well as the familiar? What roles do place, identity, and travel play in his comedies, tragedies, and histories? 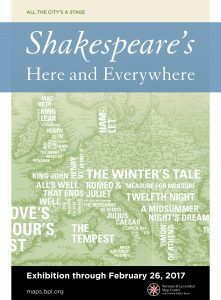 Armchair travel with the Bard to “here, and everywhere” by exploring these questions and more through maps, atlases, and illustrations of Shakespeare’s time and beyond. View the online exhibition. 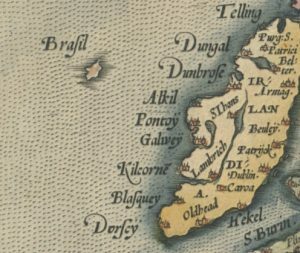 In 1325, an island appeared on a nautical chart, just off the southwest coast of Ireland. This island, shrouded in mist, was said to appear once every seven years and was home to an advanced race that was immune to sickness and the passing of time. This mystical place, known variously as Brasil, Brazil, Breasil, Hy-Brasil, O’Brasil and numerous other names, would appear on maps for the next five centuries. Its exact location on maps would change over the years, and numerous expeditions would venture into the North Atlantic Ocean to find the island. Some mariners claimed to have discovered the legendary island; however, these reports teemed with fantastic accounts of alien beings, and eventually fell into legend. In this online exhibition of forty maps from the collection at the Norman B. Leventhal Map Center at the Boston Public Library and the Mapping Boston Foundation, visitors will see the transition of Hy-Brasil over the course of five centuries from legitimate island destination, to “imaginary” place, to simply a “rock,” before it finally stops appearing on maps in the late 19th century. A variety of map formats are included in the online exhibition, such as portolan charts, woodcut engravings, copperplate engravings and lithographic prints. Hy-Brasil even makes an appearance on a 1492 globe. View the online exhibition. In 1891 landscape architect Charles Eliot asserted the bold idea to form an organization that would preserve, for public use and enjoyment, properties of exceptional scenic, historic, and ecological value in Massachusetts.At a time when land conservation and ‘being green’ was not widely discussed, his vision was forward thinking. Today, the organization he founded, The Trustees, oversees more than 26,000 acres of preserved places from the Atlantic Coast to the Berkshire Mountains. 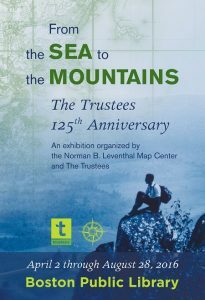 The Norman B. Leventhal Map Center at the Boston Public Library is partnering with The Trustees in celebration of their 125th anniversary on a 70-item exhibition, featuring maps, photographs, and historical items from both collections. Visitors will be introduced to Trustees properties, become familiar with a number of distinctive map formats, learn about natural landforms and geologic terms, and cultivate an appreciation for the natural, historical, and cultural treasures of Massachusetts. View the online exhibition. Histories of map-making generally emphasize the role of men; however, since the advent of the printed map, women have worked as colorists, engravers, shop owners and publishers, and most importantly as map-makers themselves. Women are active in all aspects of cartography today, and are leaders in the world of Geographic Information Systems (GIS) and digital mapping. In this exhibition of forty maps, globes, atlases and works of art from the 17th century to the present, visitors encountered works by female map creators, designers and educators, learned about the various cartographic skills employed by women over the centuries, and observed the transition of women in cartography from marginalized, to celebrated. View the online exhibition to learn more. Featuring 60 maps and 40 prints, paintings and objects, this major gallery exhibition traced the American story from the French and Indian War to the creation of a new national government and the founding of Washington, D.C. as its home. 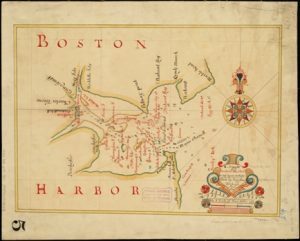 Organized by the Norman B. Leventhal Map Center, We Are One featured treasures from the Boston Public Library, the British Library, Library of Congress, and others. Highlights included rare and historically significant items that had not been exhibited previously. 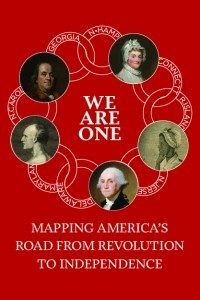 View the online exhibition and browse the online collection of Revolutionary War era maps. 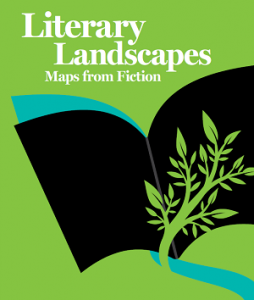 Maps of imaginary places have accompanied literature for centuries. Visualizing the fanciful worlds described in works of fiction sets the stage for events taking place in a story and often provides insight into the characters themselves. In this exhibition of forty items, visitors discovered maps from a variety of fictional genres, learned how authors create imaginary worlds, and appreciated why descriptive geography is essential to the story. People and creatures—even those who exist only in tales—are related to place, and maps of their imaginary worlds allow readers to be transported into the geography of fantasy. View the online exhibition to learn more. 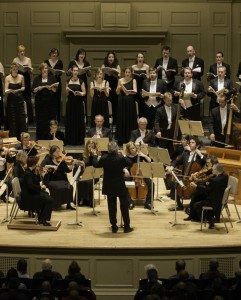 Founded in Boston in 1815, the Handel and Haydn Society is America’s oldest continuously performing arts organization. The Bicentennial Exhibition drew from Handel and Haydn’s extensive archives–including materials housed at Boston Public Library–and wide community to tell the story of its 200 years. Its musical legacy embodies the cultural heritage and development of the city and the nation. What happens when a letter reaches an unintended recipient? For writer Edgar Allan Poe, the letter has been purloined: diverted from its original destination and “stolen” by an unexpected reader. 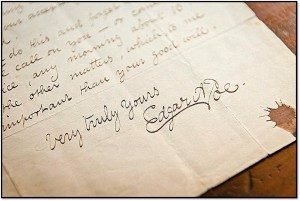 Purloined Letters featured an array of rare and important purloined letters from the Boston Public Library’s collection, including handwritten missives from such notable figures as the incarcerated Oscar Wilde, Nathaniel Hawthorne’s sister Elizabeth, and mural artist Edwin Austin Abbey. This exhibition was presented in collaboration with the Department of English, University of Massachusetts, Boston. 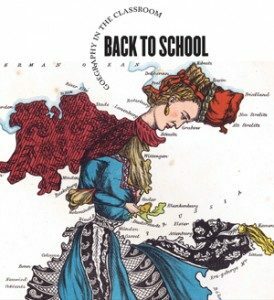 In this exhibition of forty maps, globes, games, atlases and related objects, visitors followed the evolution of geographic education, examined the visual aids used by teachers in the classroom, and explored unique student-produced geography projects from the late 18th to the 20th centuries. View the online exhibition. 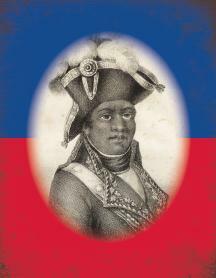 Toussaint Louverture was born a slave in the French colony of Saint-Domingue (now Haiti) in 1743. As a leader of the armed resistance against colonization and slavery, Louverture proved a seminal influence on the future of a free Haiti. This exhibition drew from the Boston Public Library’s important collection of Haitian and West Indies materials, which includes over 10,000 books and manuscripts. During the last decade, Boston as a whole has become younger, and more racially and ethnically diverse. 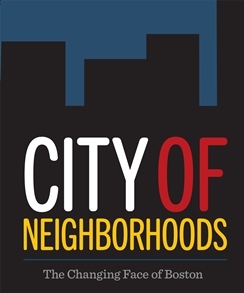 However, the neighborhoods that make up Boston often tell their own unique stories of diversity and change. This exhibition told the story of a “new” Boston by looking at the overall city and at individual neighborhoods through photos, objects, and maps, many of which were based on recent census data. View the online exhibition. 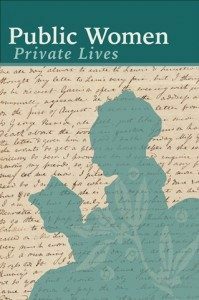 This exhibition of books and manuscripts from the Boston Public Library’s special collections illustrated the public and private lives of reputed writers such as Emily Dickinson, Louisa May Alcott, and Julia Ward Howe, as well as those of lesser-known authors such as Hannah Adams, Helen Hunt Jackson, and Annie Fields. To mark the one-year anniversary of the 2013 Boston Marathon, Dear Boston featured a selection of items from the makeshift memorial which took shape in Copley Square following the tragedy. People from across the globe contributed flowers, posters, notes, t-shirts, hats, tokens of all shapes and sizes, and—most significantly—running shoes. This exhibition was organized by a partnership that included the Boston City Archives, Boston Art Commission, New England Museum Association, and Boston Public Library. It was made possible with the generous support of Iron Mountain. Boston was the metropolis of England’s North American colonies, with the largest population and economy of any urban center through the 1750s. It was also the leading producer of printed maps, including major colonial “firsts” such as the first printed map, first city map, first battle plan, and first map engraved on copper. This exhibition brings together, for the first time in decades, a majority of these maps “made in Boston” in the century before the American Revolution. View the online exhibition. The emblem book is a Western European phenomenon that presents symbolic pictures combined with a brief motto or title and a passage of related prose or verse to deliver a moral or amusing message. 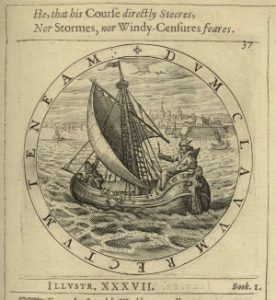 This exhibition of emblem books from the Boston Public Library’s collection focused on the high points of the genre from the middle of the sixteenth century through the end of the seventeenth century. The period following the French and Indian War (1754-1763) was a time of change and discovery in North America. 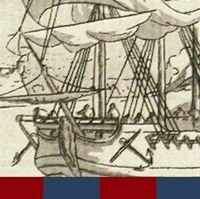 This two-part exhibition of charts, views, and maritime objects explored the decade following the war, when Britain set out to accurately chart the coast and survey the inland areas of their new resource-rich empire in Atlantic Canada, as well as the eastern seaboard extending from New England to the West Indies. View the online exhibition. 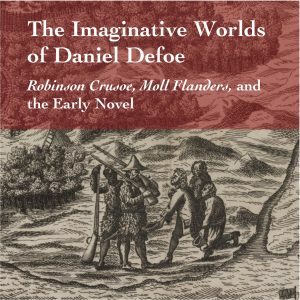 This exhibition featured the riches of the Boston Public Library’s William P. Trent Collection of Defoe and Defoeana. This was a collaborative exhibition between graduate students and faculty of the English Department of the University of Massachusetts Boston and the Rare Book and Manuscript Department of the Boston Public Library. 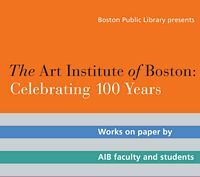 The Art Institute of Boston: Celebrating 100 Years was one of many exhibitions and other events scheduled at venues throughout the Boston area during 2012-2013 to celebrate the 100th anniversary of The Art Institute of Boston (AIB). The exhibition also celebrated the Boston Public Library’s acquisition of works by Boston artists who have contributed to the Boston art scene both as professional artists and as long-time AIB faculty members. Boston Sports Temples showcased Boston’s beloved sports venues—most notably the Boston Garden, Fenway Park, Braves Field, and Suffolk Downs—and their unique roles in the daily lives and hearts of generations of New Englanders. 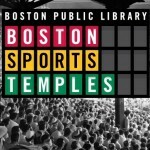 Featuring the BPL’s outstanding collection of historic sports photography, the exhibition followed the creation and evolution of these four great public venues; their varied and changing roles, functions, and communities of users; and their powerful connections with millions of devoted fans who have filled their seats night after night, season after season. 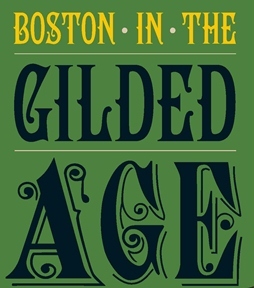 The Gilded Age–the era from the late 1860s to the late 1890s–was a period of significant growth and transformation in Boston. Ingenious engineering projects allowed the city to expand, and a devastating fire led to swift and progressive redevelopment of the commercial district. Designed to document Boston’s radically changing geography, this exhibition focused on the evolving street pattern and emerging park system, developed for the City’s growing population. View the online exhibition. The Massachusetts Institute of Technology (MIT) and the Boston Public Library partnered to present the first major exhibition on the Guastavino Company and its architectural and historical legacy. Palaces for the People featured original drawings from the company’s archives; large-scale, contemporary photographs of Guastavino Company-constructed buildings; a half-scale model vault showcasing the firm’s building techniques; and historic artifacts, photographs, and manuscripts. View the online exhibition. Designed by Charles Follen McKim of the architectural firm McKim, Mead, and White, the Boston Public Library’s historic building on Copley Square opened its doors in February of 1895 at a cost of $2.5 million. This exhibition featured historic photographs documenting the library’s construction, dating primarily from August 1888 to December 1889. 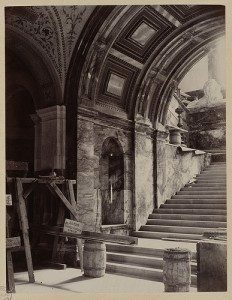 Held by the BPL’s Rare Books & Manuscripts Department and selected from the records of the library’s board of trustees, these photographs provide a pictorial narrative of the construction of the McKim Building, from the first shovels of earth to the beautiful edifice that stands today. Twenty five years ago, the MBTA relocated the Orange Line, dismantling the elevated rail that had long defined the City’s Southwest Corridor. Two years prior to the project, the private nonprofit agency URBANARTS organized, on behalf of the MBTA, a program called Arts in Transit. The project paired photographers with photography students to document the corridor in transition from Forest Hills to Dover Station. In the fall of 1985, the students and their teachers began photographing the Orange Line and its architectural and social surroundings. This exhibition featured over 65 photographs from the project held by the BPL’s Print Department. This timely, election-year exhibition featured approximately 30 maps, political cartoons, photographs, and other graphic images that date from the 1780s to the present. The display began with an exploration of gerrymandering—two hundred years of manipulating political districts for partisan objectives—and included maps illustrating the extension of the vote to non-property owners, blacks, and women. America Votes also featured multiple election results maps, with examples ranging from several early efforts to the most recent campaigns. View the online exhibition. Mixit Print Studio was established in 1987 in the former Mixit soap factory in Somerville, Massachusetts. 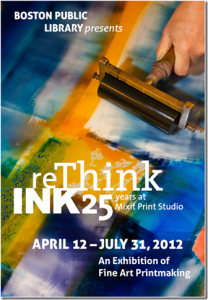 For 25 years Mixit Print Studio has provided a fully-equipped printmaking studio, aesthetic nourishment, and technical and critical exchange to Boston-area artists. This collaborative exhibition—produced by the Boston Public Library and Mixit Print Studio—celebrated the studio’s 25th anniversary and the library’s deep and long-standing connection to the Boston printmaking community by featuring over 150 works by 71 artists in three venues throughout the Central Library. Culled from Special Collections archives of the Boston Browning Society, whose 19th century members donated unusual and voluminous items to the Boston Public Library to assure their preservation, this exhibition featured handwritten letters, poetry, and related manuscripts that illustrated the development of Robert Browning as poet, lover, and playwright. Editions of the Brownings’ published books were displayed alongside significant photographs and noteworthy portraits shedding light on the private and public Browning, his marriage to the poet Elizabeth Barrett, and his survival as a poet. Between the Revolution and the Civil War, Boston was the preeminent center of literary creativity in the United States. 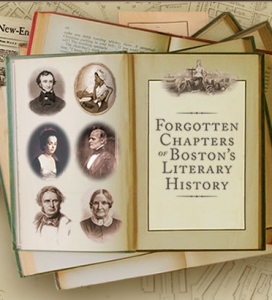 Forgotten Chapters, an exhibition developed by Boston College faculty, students, and staff, explores stories about Boston’s literary history that have faded from memory. The companion website includes overviews of each “chapter” as well as an extensive audio-tour of the exhibition. When reading maps, we expect map makers to use standard conventions, especially in regard to map projection or composition, orientation, scale, and symbols. The maps displayed here highlight a variety of unconventional maps spanning the history of the printed map. View the online exhibition. 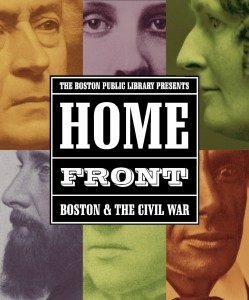 Through original manuscripts, prints, artifacts, and other material from the Boston Public Library’s special collections, Home Front provided a deeply personal look at this extraordinary period in American history and the war’s enduring impact on Boston and its citizens. To commemorate the American Civil War’s sesquicentennial, the Norman B. Leventhal Map Center at the Boston Public Library took a geographic and cartographic approach to exploring and illuminating the causes of the conflict, the conduct of the war and how it was remembered in later years. 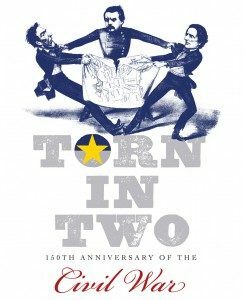 Torn in Two showcased 50 historic maps interwoven with 40 photographs, paintings, prints, diaries, political cartoons, music and press of the period, all from the Boston Public Library’s special collections. View the online exhibition. 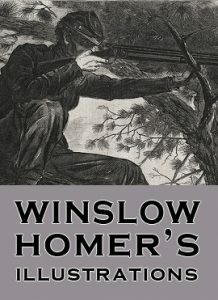 This exhibition explored Winslow Homer’s wood engravings for illustrated weeklies from 1858 to 1873. In the span of these 15 years, Homer portrayed rural life in America, the brutality of the Civil War, the changing roles of women, and the favorite pastimes of the American people. Tour “vintage” Boston through this wonderful collection of postcards depicting some of our city’s most famous places and spaces in bygone days. 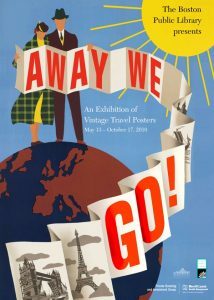 Travel to twenty-eight handpicked destinations, on six continents, on a globetrotting route nearly 45,000 miles long — via some of the Boston Public Library’s most beautiful and important travel posters. In celebration of the bicentennial of Edgar Allan Poe’s birth, The Raven in the Frog Pond featured materials from the Boston Public Library’s special collections and elsewhere to tell the important story of Poe’s relation to the city of his birth. 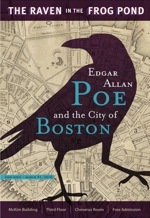 Curated by Boston College professor Paul Lewis, the exhibition presented newly uncovered information about Poe’s time in Boston and his celebrated squabbles with area authors, explored urban legends that have grown up around the Poe-Boston story, and considered what Boston has done (or failed to do) to celebrate this native son. This year-long exhibition celebrated over 160 years of collecting by the BPL and featured some of the most beautiful, rare, and unexpected holdings from the library’s rich special collections. 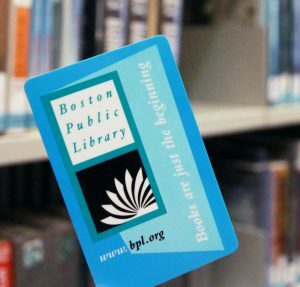 Enjoy these gems from the BPL’s collections, revisit some old favorites, and discover a few new surprises as well. 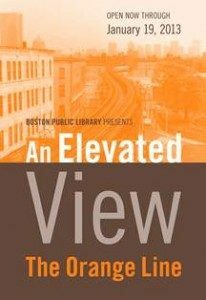 Through a selection of 48 bird’s eye views of New England towns, learn about the region’s expansion and evolution during the last half of the 19th century. 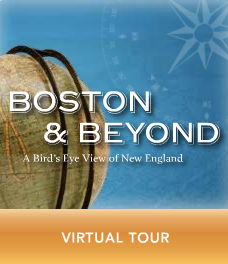 Take the virtual tour created from the exhibition Boston & Beyondand unravel the story of who we are, where we came from, and how we choose to perceive our world. View the online exhibition. 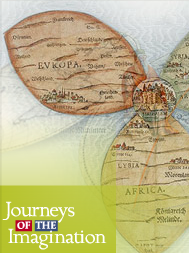 Journeys of the Imagination explored the various ways that map makers from the 15th century, until today, have created their real and imagined world views for the public. The maps in this exhibition are examined not just as geographic records of the world at a particular time, but as documents that have a story to tell. View the online exhibition. In Faces & Places, the Norman B. Leventhal Map Center selected 70 historical maps portraying the countries from which the greatest number of Bostonians originate. 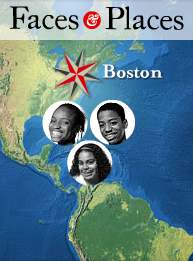 The maps were juxtaposed against a collection of essays by middle school age students, depicting their family’s journeys to Boston. View the online exhibition.